Happy Monday, it's time for another Critter Challenge! This week's challenge is a sketch challenge. Dustin Pike is this months Sponsor at the Critter Challenge Blog, and I chose to use his cute Graduation image along with this weeks sketch. Wouldn't this be cute for a Pre School or Kindergarten Graduation! I printed the image on Watercolor Paper, then Black Embossed, and colored using the Marker Watercoloring Technique. The panels behind the image are embossed with the Cuttlebug Stars folder. Grab some stamps and play along at the Critter Blog, at the end of the month a lucky player will be winning their choice of 3 digital images from Dustin's store. cute card. I love Dustin's dragon designs. That would be a super cute image for a kindergarten graduation! SWEET! Hope you had a fun weekend! Lisa this card is so super cute. Great theme!!!! Thanks so much for a perfect DT post. Sweet, lol!! what a great card. Such an adorable card Lisa, I really like the embossed stars in the background! 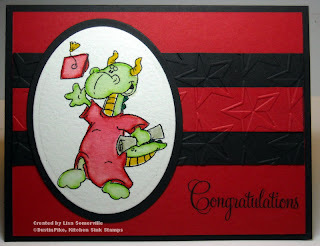 I thinks it's a great card for ANY graduation :-) I love the embossing. Fabulous card! Very fun! Lovely coloring on that sweet dragon.